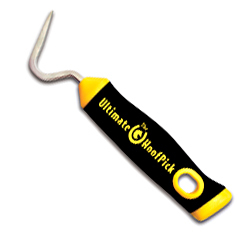 This is one hoof pick that will live up to its name – the Ultimate Hoof Pick. It is a solidly built and well-designed tool that will do the job right. No more broken or bent hoof picks and no more dealing with hard-to-hold, wimpy hoofpicks! This is worth every penny. And, it's the last hoofpick you’ll ever need. The Jackhammer Ultimate Hoof Pick will dig out the worst packed mud or snow from your horse’s hooves, even the hard-as-concrete type. Comfort and efficiency were top priorities in its superior design. The wider and longer blade is designed at the proper angle and the easy grip handle fits solidly in your hand. It is built to last a lifetime and guaranteed not to bend or break or the manufacturer will replace it – no questions asked!